The yellow, black and white Yamaha YZF-R6 is screaming bonkers through useless earplugs and holds only two gears throughout the tight track while the Bridgestones go through their warm-up cycle. 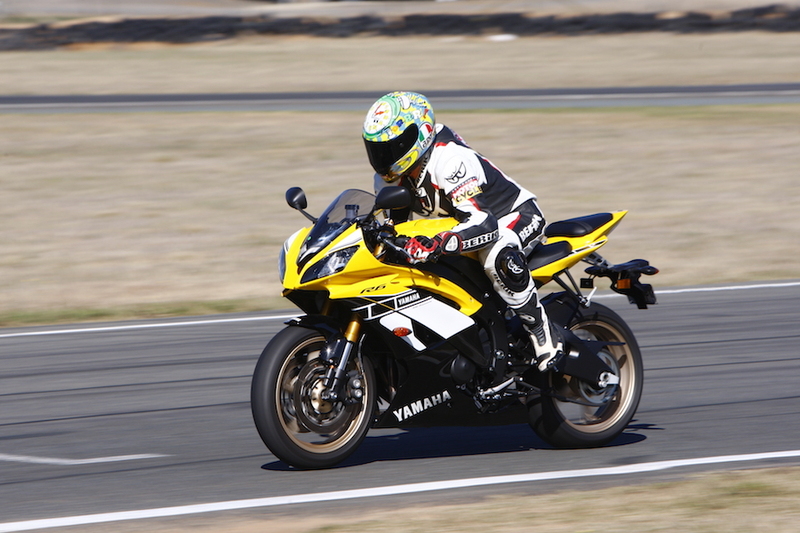 We’re at Wakefield Park in NSW for some track testing, and it’s all about the times. The R6 pulls out of any turn from 6000rpm with a responsiveness unimaginable a few years ago on a Supersport 600. After two laps she is edging closer to 10,000rpm on exit in second gear, spinning up to redline with perfect throttle connection. The front-straight first-turn kink is pegged at maximum revs in third and 16,500rpm sounds like deafening howl of four tornados in one. The livery, harking back to 70s American GP title winner Kenny Roberts, grabs people’s attention as we flash past the pits, and the game of hard accelerating and aggressive braking continues for the rest of the brilliantly sunny day. A few hours later on the ‘legal’ road the Yamaha R6 begs you to remain in touch with your racing persona. But now it’s only the digital numbers on the speedo that are important, so forget the 270º analogue arc that sweeps from idle to 16,000 plus. In this setting the bike is a different beast and can suddenly feel underwhelming. At a restless speed, pegged at 110km/h, the 60th Anniversary is over 4500rpm shy of its peak torque – a lowly 67Nm at 10,500rpm. But don’t worry about that; not all titles are won by torque. The R6 is about finding the right gear and the revs to extract every last bit of the competitive juice from the 97kW available. Still, there is plenty of drive and even better noise via the airbox if you are a gear or two or three out from the ideal. And commuting never looked this good. As you can see, the R6 has a complex dual personality – from the serious lunacy of the track where you can revel in the cyclonic noise, to the restrictions of the street where you’ll hear mechanical whirls and whines reminiscent of a V8 Supercar’s transmission. Under 7000rpm there is a feeling of being trapped, but that’s the price you pay for the maniacal zing to redline. Gears go from sharp and slick to deliberate and a bit notchy. But the perfect pinpoint steering and bump control remain. It is even comfortable. Better yet is the stability. Nothing will phase the R6 on a bumpy road. I was born mid last century, so the handlebar is excruciatingly low for me, but if you’re a nineties child you won’t complain. Braking? You’ll want for nothing except maybe ABS, but even then the brakes are as good as you will need once the front stoppers have decent heat in them. Yamaha has left the R6 well alone for the past few years, maybe for good reason. 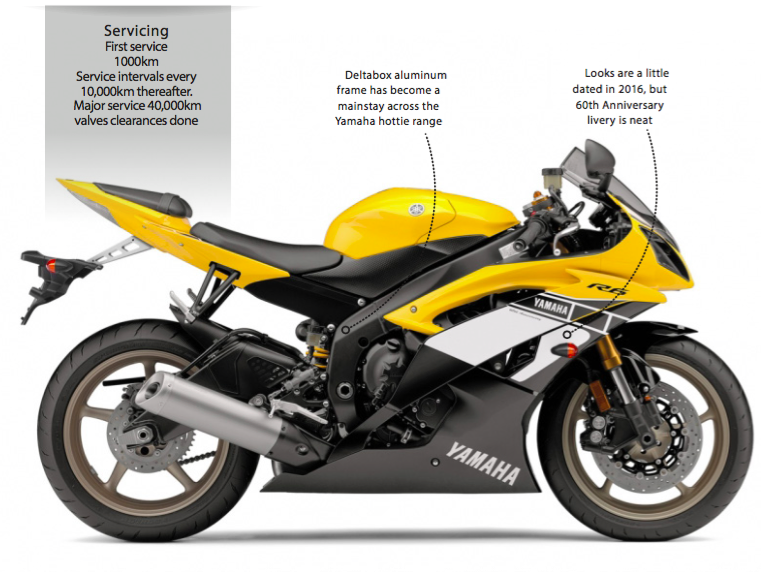 It is a stepping-stone model from the sporty LAMS brigade to the full-featured R1. From the R3 at $6099 to the $23,499 R1, the R6 sits neatly at $16,799 (+ ORC) offering scintillating performance without the technology – bar a slipper clutch and an immobiliser. Even then, you won’t miss a thing. The Six is the step into competitive racing – just go fit the pipe and the glass – or the leap before moving up into the intimidating but seductive Superbike category. Is that relevant? You betcha, as relevant as any motorcycle that puts thrills and looks alongside quality and performance. Just make sure you get your mobile number sign-written on the white panels on both sides of the fairings. If you are as good as the R6 is capable, you might just get that factory call!